The NDA's room bloc at the Hilton San Diego Bayfront on Coronado Bay has been extended one last time until Monday, March 4. It is important that you call the hotel at (619) 564-3333 to reserve your rooms for the NDA's 40th Anniversary Celebration, March 23 – 26. 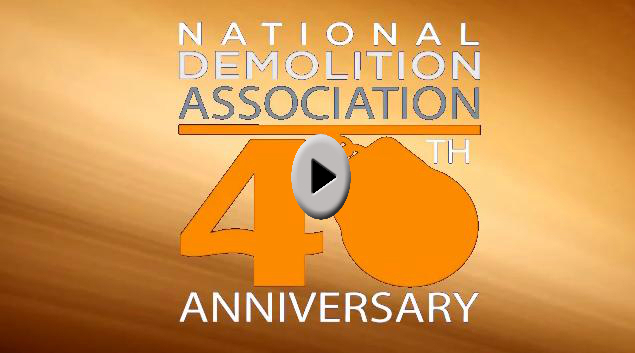 Remember when you call to specifically mention that you are with the National Demolition Association's group. You can also register at the hotel should you decide to be a walk-in. Again it is important to tell the folks at the Hilton's registration desk that you are part of the NDA's 40th Anniversary Convention. On Tuesday, March 26 at 3 p.m. Jeff Kroeker, of Kroeker, Inc. in Fresno, Calif., will be installed as the National Demolition Association's 22nd President. The election of 2013-2014 officers and directors as well as the presentation of this year's Member-Get-A-Member prizes will take place as part of the NDA's 40th Annual Meeting being held in Room 26 A&B in the San Diego Convention Center. Prices for construction materials moved higher in January, propelled by large jumps in items used in new housing and nonresidential building renovations, according to an analysis of new federal figures recently released by the Associated General Contractors of America. Association officials said that contractors were paying more for materials even as the pending federal spending "sequestration" threatens to cancel an estimated $4 billion worth of construction activity this year. The construction software space looks considerably different today than it did even just a year ago. In the past 12 months, a number of acquisitions have changed the landscape of construction software, causing contractors take notice. But what does it all ultimately mean in the end for IT plans in construction? A big trend among many of the large construction software providers is using an acquired product to offer construction companies a more cohesive, integrated solution, tying together disparate technology components. One of the more recent examples of merger and acquisition activity in the construction industry comes from Illinois-based Textura Corp. The Environmetnal Protection Agency regulates scrap metal demolition because it can be quite dangerous. First, a serious fire danger exists, since scrap metal recycling demolition contractors use shears and blowtorches to cut apart metal pieces. For instance, the Los Angeles Times recently reported that there has been a minimum of 23 explosions and fires at scrap metal companies in California in the last three years. Moreover, processing metal improperly releases toxic dust that can seriously harm nearby ecosystems. An unused natural gas holder near the Jones Falls Expressway in Baltimore was imploded recently. The Cuyahoga County Land Bank soon might be empowered to issue millions of dollars worth of federal tax credit bonds to pay for demolition of vacant, abandoned and blighted properties. An Ohio delegation from the U.S. House of Representatives announced the introduction of legislation to distribute bonds worth $4 billion to states or land banks nationwide to stabilize neighborhoods by clearing the ruins of the foreclosure crisis from urban areas. It looks like the Metrodome may be down to its final year. Officials say the stadium, which opened in 1982, likely will be torn down in early 2014 to make way for the new Minnesota Vikings stadium. The question is eternal: What makes a good leader? Predictably, we have no definitive answer. But one thing is certain: As business technologies and processes evolve, hot industries come and go and employee demographics shift, the best leaders are those who can change with the times. They're the ones with foresight and adaptability, who don't rule from a manual but rather customize a culture that's specific to each company, its mission and the personality of its work force. Improving underlying economic fundamentals, the existence of large pent-up demand balances, and the diminishment of economic fiscal cliff uncertainty will combine to result in strong growth rates in 2013 and an increase in cement consumption. According to the latest forecast from the Portland Cement Association, there will be an 8.1 percent growth in cement consumption in 2013, significantly higher than the tepid growth projected in its fall 2012 report.